Stop Making To-Do Lists. They Don’t Work. 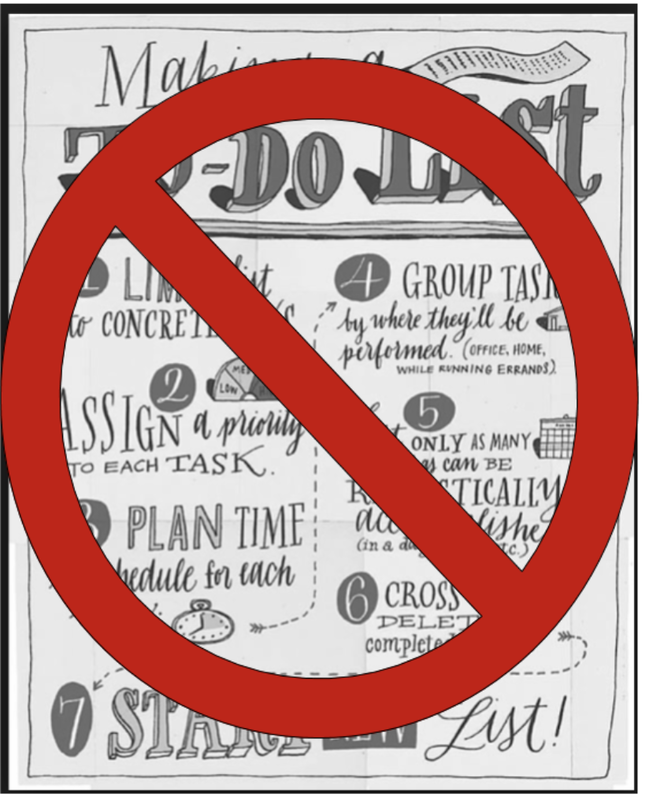 It’s high time I make an important distinction between a to-do list and a checklist because too many people are wasting too much time on the wrong thing. As a productivity expert, that makes me nuts. A to-do list tells you something you have to do. A checklist tells you how to do something. What is a Big Project? I have had the opportunity to witness true productivity comedy on four occasions now. While meeting with some of my productivity clients and reviewing their to-do lists I have seen an item that all four of them considered to be a good thing to put on those lists. WRITE BOOK is NOT a to-do list item. It’s not even a goal. Publish book might be the goal but putting write book on a to-do list is a great way to guarantee that you never write that book. Writing a book is actually a wonderfully simple and illustrative example of what I’m talking about. While write book is not a to do, write 100 words is a GREAT to do list item. Depending on how well you write, then 1 page or even 5 may be a reasonable to-do list item. But what about the more complex stuff? Well, I spent 10 years of my life working in construction and real estate development and I can tell you that in terms of project planning you’d be hard pressed to find something more complicated than a construction project. There is an enormous amount of planning that goes into any construction project from finding the property and inspecting it, coming up with a design (which involves architects, consultants, local code experts, several types of engineers, etc…), permitting which can involve local and regional authorities, and of course financing the whole thing. When it comes to building you’ve got multiple trades working at different yet coordinated times, weather, unforeseen conditions, more financing, lead times on materials and products, interior and exterior work, and about 5,000 different stakeholders. How do you keep track of it all? When it comes to managing a big and complex project, especially one that you will do iterations of over and over like “Write Book” or “Build Big Building” your best bet is a project management tool like Trello. It allows you to break down that enormous project into much more manageable chunks. If you can start to break things down, that’s when we can begin to optimize, automate, and outsource everything. I have to reiterate, I’m not talking about creating to-do lists, I’m talking about checklists. Checklists, To-Do Lists, It’s, all the same, isn’t it? When I was 16, I got my private pilot’s license and logged several hundred hours in small planes. I’ve also experienced two plane crashes and walked away unharmed but that’s another story…no matter how many times I got in that plane, I would pull out the laminated checklist which told me the process to go through when inspecting the plane, the engine check process, the taxiing and communication process, and the takeoff process. No matter how many times we do something and how ingrained the steps are in our head, a checklist gives us comfort and thoroughness. I used them, commercial pilots use them, surgeons in many hospitals use them, checklists are everywhere. Again, the difference between a to-do list and a checklist is that to do tells you what you have to do but the checklist tells you HOW to do it. Neurologically speaking, our minds are better at remembering and understanding the pathways to end goals rather than the goal itself. A soccer player will remember the play where he ran left, circled around the striker, stole the ball, ran up the right side of the field, got to within 50 feet of the goal, and finally kicked the ball with just a bit of side spin. The ball sailing past the goalie’s hands and into the back of the net will likely fade from his memory and he’ll have to watch a video of the game to remember the look on his own face when he won the game. Ignore the card that says to do, instead, look at the headings and think how they might apply to your project. If it’s a book, maybe you have one on historic research for your WWII novel, and a card for character development, and then your chapters. If it’s a construction project, maybe I have a column for plumbing (which includes an item on installing a kitchen sink, something I’ll definitely do again on another project) and another for furniture. Now this is what you see when you click on an item. Isn’t that beautiful? Every step I need to install a kitchen sink. These are not to dos remember, this is the process, step by step for HOW to install a kitchen sink. I can share this with my team, I can assign it to people, and best of all I can always update and improve this process to make it more optimized so that I can possibly automate parts of it, and even outsource it entirely. The visual nature of a planner like this means you can try to anticipate all of the moving parts at the beginning of the project and then update them on your own or collaboratively with others as needed. This brings us full circle to the underlying principle about the timing of tasks. Obviously, install kitchen sink is not a to-do where you can say that 3 pm will be the right time to deal with it. In this case, the task could be done by FollowUp.cc which will send you reminders every day at 3 pm. Throw away your to-do lists. Start creating checklists and you’ll get those large projects under control and….you guessed it…..DONE.